Before the Rio 2016 Olympics got underway at the end of last week, the Brazilian fruit trade broken a world record of its own. 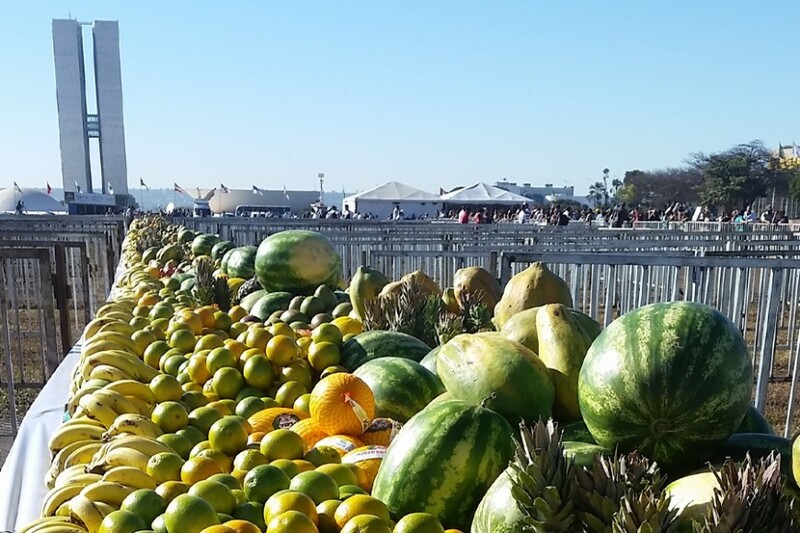 Just a few days before the opening ceremony (something Google celebrated with some cute fruit doodles), various agricultural groups teamed up in the country’s capital, Brasilia, to oversee the assembly of the world’s largest ever fruit display. In the end, more than 18 tonnes of fruit and vegetables were laid out on tables stretching to 240 metres long outside the eye-catching National Congress building. Sourced through donations from producers, the feat underlined Brazil’s vast potential to produce a startling range of fruit and vegetables, even if the logistics and politics involved don’t always lend themselves to world-beating service. With the international spotlight trained on Rio de Janeiro for the 2016 Olympic Games during most of August, it’s worth taking a moment to consider Brazil’s current position in the global fresh produce business. While the country clearly offers huge potential as a source of fresh fruit and vegetables as well as major market, the country’s growers, exporters and importers have had to clear a number of hurdles over the past few years in order to keep their progress there on track. National industry association Abrafrutas, which represents around three-quarters of Brazil’s fresh produce exports, recently unveiled Frutas do Brasil (Fruits from Brazil), a new campaign designed to help double the country’s foreign sales by 2020 through diversification in terms of both products and markets. In short, much like the organising committee for Rio 2016, Abrafrutas wants the world to focus on Brazil’s abundant sunshine, that key ingredient in all of the fruit it produces and sells to the world. Melons are clearly a priority for those in charge of selling the image of Brazil as a key source of fresh produce overseas. As Eurofruit reported earlier this year, two of the country’s leading shippers, Agricola Famosa and Itaueira, are supporting those industry efforts with investments in new acreage and product lines. As well as expanding its melon offer, Agricola Famosa is ramping up production of bananas and papayas and will shortly add asparagus to its line-up, with the aim to reduce its reliance on melons and watermelons. Fortaleza-based Itaueira, meanwhile, continues to diversify its melon offer for the European and US markets, with varieties Piel de Sapo and Galia now playing a more prominent role alongside the company’s flagship yellow honeydews. The company is sending limited quantities of Galia to Spain to enable it to fine-tune packaging and transport issues and to consolidate the brand on the market. Non-European markets are also playing a more prominent role in Agricola Famosa’s export programmes. The company now ships around 10 containers a week to the Middle East and is looking to secure access to the Chinese and Japanese markets in the near future. It remains to be seen whether the current jump in exports becomes a long-term trend rather than a short-term reaction to the slump in the domestic economy. Both Agricola Famosa and Itaueira are optimistic that last year’s launch of the Frutas do Brasil country brand will provide fresh impetus to exports. In Europe, there are signs that Brazil’s position in the market as a melon supplier is strengthening. One of the region’s largest importers, Total Produce, recently reported stronger demand for Brazilian seedless watermelons across much of the Nordic area, while another importer, Dutch group HillFresh International, recently added yellow Honeydew melons from Brazil to its rapidly expanding melon programme. Sold under the Cepi brand, the fruit is apparently proving a hit with European consumers. The melons are produced by Itaueira in the north-east of Brazil, and only harvested when fully ripe, enabling the supplier to guarantee high sugar levels. What’s more, Brazil’s ability to supply the melons year-round – combined with the fact that Itaueira currently only sells about 7 per cent of its melons overseas – means that there is plenty of opportunity to create a regular, dependable supply line into Europe for what is a high-value item. For other products too, there are examples of success being achieved. Limes in particular are proving more and more popular in Europe, as are various exotic lines including papayas and mangoes. The picture is a little less clear for Brazil's apple and pear export trade, which has recently turned down the volume on its previously prominent marketing campaign for topfruit especially in the European market. Even if demand falls at home due to economic stagnation, reports suggest apple imports continue to grow as demand outstrips supply. For domestic producers nowadays, there is less need to look outside Brazil to increase sales. The weather has also played its part lately in making sourcing from Brazil more difficult, primarily a drought reckoned to be the country’s worst in decades. Koen Maes, business development manager at Belgian importer Special Fruit, says the meteorological phenomenon El Niño caused considerable disruption to the company’s Latin American programmes during 2016, especially when it came to product availability out of Brazil. Lieve Michielsen, the importer’s exotics product manager, reveals that extreme droughts in Brazil are one reason why building sales of niche items like papayas has not been so easy over the past 12 months. Melons and watermelons face a similarly precarious situation, with low water levels likely to result in restrictions in its use for irrigation. As a result, Agricola Famosa has reduced its acreage in the state of Ceará and expanded its production base in the state of Rio Grande do Norte, while investing in new production in the states of Pernambuco and Piauí. In Itaueira’s case, the drought has meant reducing the production season in the worst hit areas and extending it in others. To tackle the shortage of water, the country’s biggest producers employ state-of-the-art irrigation technology in order to enable them to make the most of what little water there is. “Every year we manage to reduce our per hectare water usage by employing more advanced technology, as well as by investing in alternative solutions including the harvesting and storage of rainwater,” says Adriana Prado. “At the same time, we are constantly investing in renewable energy sources like solar energy to limit our reliance on hydroelectricity, for which Brazil relies for the vast amount of its electricity today. Despite the well documented downturn in Brazil’s economy of late and the devaluation of its currency, the real, Brazil remains an important target market for a number of fruit and vegetable producers around the world. For example, it remains the single largest export market for Portuguese Rocha pears, even if the economic uncertainty over the past few years has seen that dependency diminish. Portugal is busy making new commercial in-roads in countries such as Germany and Poland closer to home helping to mitigate any losses, but its commercial ties with Brazil will be there for many years to come. Elsewhere, the same adverse conditions that have hampered producers are creating new opportunities for service providers like Decco, a post-harvest solutions specialist based in Spain. Later this year, the group is poised to open a manufacturing plant in the country – its first in Latin America, in fact – to provide local supply of polyethylene wax and shellac coatings that meet European requirements. According to marketing director Daniel Alabadi, droughts and heatwaves especially in Brazil are boosting demand for products like its own Deccoshield, a liquid sunscreen that reduces heat stress in plants. As is the case for those competing at the Olympics itself, fortunes for companies involved in the Brazilian fresh produce trade will be mixed. For some, the prospect of achieving gold medal status is well within their reach; for others, building success in the longer term is a more realistic goal. Whatever happens, Brazil’s moment on the international stage could contribute in many ways to the country’s future success in various industries, not least fresh produce.